Rabbi Lau meets with Cave of Machpelah heads to discuss ways to boost hold over the ancient site, strengthens Hevron/Kiryat Arba Jews. 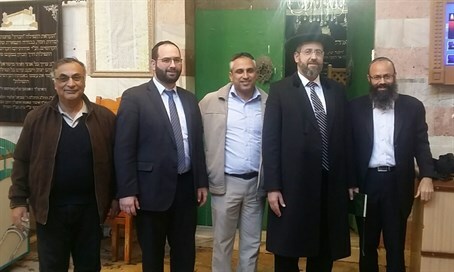 Ashkenazic Chief Rabbi David Lau held a special visit to Hevron and Kiryat Arba in Judea on Thursday, where he took part in a discussion with leaders of the community. In the talk Rabbi Lau together with heads of the local religious council and Hevron and Kiryat Arba heads spoke about ways to strengthen the Jewish hold over the ancient Cave of Machpelah in Hevron, where the Jewish patriarchs and matriarchs other than Rachel are buried. The discussion comes after a shocking move last October, when UNESCO passed a resolution labeling the ancient Jewish burial ground as an "Islamic site." In his visit the rabbi was given an overview of the goings on at the Cave of Machpelah by those tasked with managing the holy site, and was told about the security steps being taken in light of the current Arab terror wave. Afterwards he prayed at the Cave. Rabbi Lau also took part in the conclusion of a series of Talmud study at a Hevron school dedicated to Ya'akov and Netanel Litman of Kiryat Arba, which was attended by their family members. The two were murdered in a shooting attack south of Hevron last November. Later in the evening the rabbi gave a lecture at the Kiryat Arba pre-military yeshiva, and was to give another lecture afterwards at the nearby town of Bnei Haver.